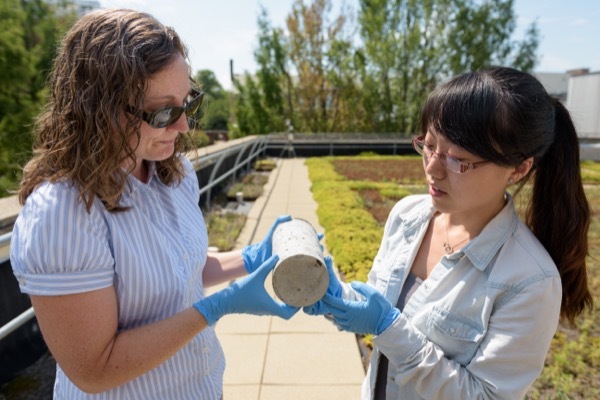 Julia Maresca (left) and Keira Zhang are conducting research aimed at identifying bacteria that can serve as an early damage-detection system in concrete. 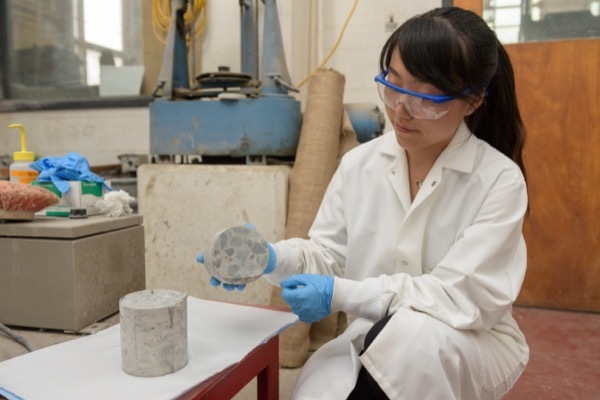 Keira Zhang is working with Julia Maresca on research aimed at identifying bacteria that can serve as an early damage-detection system in concrete. 8:34 a.m., Aug. 31, 2015--A small “garden” of concrete cylinders shares space with the colorful sedum, chives and crocus on Colburn Lab’s green roof at the University of Delaware. Although the cylinders themselves aren’t alive, bacteria living on or in them could serve as valuable indicators of damage growing inside the concrete. Located on the green roof because it offers access to daily weather data, the cylinders are part of a research study led by microbiologist Julia Maresca, an assistant professor in UD’s Department of Civil and Environmental Engineering. Maresca hopes to find biomarkers that can tell inspectors whether concrete has been damaged before that damage is visible to the naked eye. The current effort focuses on damage from a problem common in the Mid-Atlantic region called the alkali-silica reaction, or ASR. When silica, other cations, and water react in concrete, a gel is formed that expands inside the concrete, causing extensive cracking. To identify candidate bacteria, Maresca worked with structural engineer Thomas Schumacher to prepare a set of concrete test cylinders using materials that are highly susceptible to ASR and a parallel set made of materials resistant to this reaction. All of the cylinders were placed on the green roof in the spring of 2013. Since then, one pair of cylinders has been removed every four to six weeks for analysis of the bacterial populations. Maresca explains that because very few bacteria can be cultivated in the laboratory, DNA analysis is needed to identify the bacteria living on and in the concrete. Doctoral student Keira Zhang discovered that a method used to extract DNA from ancient bones also worked on concrete. Using this method, DNA from all of the cylinders removed from the green roof over the past two years is underway. The Delaware Department of Transportation provided concrete materials and mix designs for the test cylinders, and Devin Harris at the University of Virginia will provide field samples. Seed funding for the project was provided by the University of Delaware Research Foundation, and the research is currently funded by the Mid-Atlantic Transportation Sustainability University Transportation Center. Undergraduate research assistants Mary-Katherine Sutter, Paul Moser and Alison Treglia also contributed to the work.